“Wednesday, I was arrested and sent to jail,” is what your blog might say if you decide to try and duplicate this project. You may, however, be fortunate to be still writing your blog, as ATTEMPTING TO BUILD YOUR OWN REACTOR can be quite dangerous. That’s what [Richard] did using household items such as clock fingers for Radium, and smoke detectors for Americium. After the radioactive elements were separated from their household “containers” and melted down, they created a small explosion on his stove. 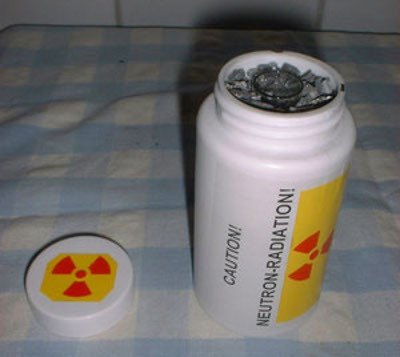 This attempted experiment is based on one that was done by [David Hahn], AKA, “The Nuclear Boyscout”, in order to obtain his nuclear energy badge. For what it’s worth, [David] did attain the rank of Eagle Scout, however, he turned his parent’s house into a Superfund EPA cleanup site in the process. The video after the break describes the process of making a reactor from household materials. This video may be entertaining, but duplicating it is not recommended (and would be somewhat expensive). He isn’t even using it to heat water…he just wants to make Plutonium? He really is a mad scientist! BTW…the site formatting here cuts off the video frame. I did go back in time and buy some of those thorium Lantern bags for anyone interested. This is not cool project. It’s too dangerous. Not good idea. This is a cool project. It’s too dangerous. Very good idea. Maybe this should be called “How I Learned To Love The Dirty Bomb”. Or “Why I Joined The Hair Club For Men”. Or “Kids? Who Wants Kids?”. The device only counts as a nuclear reactor when actual fission was accomplished (i.e. went over the criticality limit). Fortunately for him, that did not happen. Otherwise, he’d be in hospital with only a few days to live, maybe less if he is fortunate. So to be clear, you’re saying that *any* fission, no matter how small or how well his preparations were, would give him a fatal dose of radiation, yes? In other words, you think that fission radiation is a binary event. It either doesn’t work, or results in a “demon core” type of accident. I’d be interested to hear your opinions on other things, such as current events or who is a good candidate to vote for. Sounds exactly like American poltics. 2 choices only differentiated by their extremes and polarizing issues, Gun Control and Healthcare, while the rest of the world looks on in amazement as people argue which is better, far right or far right! As for this, we are absorbing radiation all the time. Standing next to one of these for a little bit is probably no worse than getting on a plane. Remember he got all this stuff in easily available stuff, he didn’t have to go and scrape anything from the surface of the sun. To be clear, NO – READ the post; he’s quite specific about “criticality”. um … you do know what “criticality” means I ‘spose? criticality is an often-misused or misunderstood word. every operational nuclear reactor is in a critical state, where there is an equal number of neutrons creating reactions as there are being released. Even if it were not used as a light it could be used as a battery! Yes, but he wants to make one more powerful than a tritium based one. I don’t think that the Queen will be happy now he has made her head radioactive. You can also make a harnsworth farnsworth reactor and use it as a neutron source, it is much more controlled and can generate a lot more than this, though it is much more expensive and arguably more complicated. To the staff, I didn’t mean to report, I accidentally pushed the wrong button, sorry. I did that too the other day. It would be awesome if they’d switch “report comment” and “reply” so that “reply” is in the lower-right corner, as it is on all Disqus sites and lots of non-Disqus sites too. Oh my goodness this is awesome! I want to try building a reactor! Great…. Now I can get everything I need to power my Flux Capacitor. Just trade some Lybians a box of shoddy pinball parts for some plutonium. Don’t forget your bullet proof vest. At least part of this won’t work as advertised. While he specifically says that OLD lantern mantles had thorium, he’s using new lantern mantles which don’t have any. The people who will do this won’t need [Khordas] to tell them how to do it. For anyone interested, I have seen videos on youtube showing transmutation of elements using a Am/Be neutron source. It’s not that hard to build a nuclear reactor at home. All you need is a neutron source, a moderator and an element to be radiated by the neutrons. It will be very low flux, but it will transmute elements. It seems to be more difficult getting the equipment to measure the resulting nuclides than the actual ingredients for the experiment itself. You’re gonna love my nukes! In the future there will be one of these in every car in the world. And it will look exactly like this. Anybody who knows anything about the Radioactive boyscout knows the number 1 lesson from this story is “don’t do it”. The person who made this sounds like somebody who read the 1 paragraph summary of “hurr hurr, you can get radioactive stuff from smoke alarms” and just decided to go jump right in. wow, im going to start using this video instead of rickrolling people. Why do you draw a line? The world wouldn’t be anywhere near where it is today if people suddenly drew a line when they hear about someone doing something dangerous. You’re glad he’s pulled himself out of the gene pool, do you say the same about Marie Curie? Comparing this guy to Marie Curie? Srs? Perspective called, it wants to know why it hasn’t heard from you in so long. How do you know he hasn’t already had a few kids? His kids (if he has any) won’t have kids. I don’t know if that’s good or not. as seen in the description of the Youtube video. This company seems to make documentations about fringe science . This is no real build. Could have tried to make a thermoelectric isotope generator. Grew up not far from David Khan and now I work at the same shipyard that built the Enterprise, small world. You guys should look up “Cultural acquisition of a specific learned response among rhesus monkeys” or “The Wet Monkey Theory” before you condemn this as stupid, dangerous, and not to be done. Seriously, if we chase everyone away from nuclear study at a young age through fear, we’ll be without nuclear scientists in a generation or two. The same thing is also happening in chemistry. Have you seen how nerfed chemistry sets have gotten in the past few decades? If their numbers do shrink considerably, it’s far more likely that it will be due to the runaway costs of higher education than to the fact that Little Johnny’s chemistry set doesn’t come with a fist-sized chunk of polonium. Some kids want to be doctors. Nobody in their right mind would encourage one to perform amateur surgery, and guess what, there are still lots of doctors. I disagree in a few ways with what you’re saying. Higher education is not needed for innovation. Yes, it can help, but if little Johnny is already putting his polonium in a cloud chamber when he’s 10, he’s gonna be at one hell of an advantage over students who didn’t encounter nuclear physics until their college professor does the same for them from behind 3 feet of leaded glass (or just shows a video, given current education funding). Also, most doctors are little more than plumbers. Yes, humans are more complicated than the kitchen sink, but about the same amount of innovation happens on the front lines when fixing either. Your analogy goes too far off the scale. Not giving little Johnny ANY isotopes all the while telling him he will die, HORRIBLY, if he ever sees any radiation is not the same as saying “Hey Johnny, let’s hold off on the breeder reactor until you’re old enough to drive”. Surgery is not the basics of being a doctor, fixing people is. Fists of polonium is not the basics of being a nuclear physicist. We don’t tell children “Don’t touch that stethoscope! It has HEALING coming out of it! It’ll kill you and everyone you love! Here, play with this adhesive bandage with the adhesive taken off” That’s the sort of paranoia I see when I look at popular opinion of nuclear science (and chemistry). Al Qaeda collect smoke alarm and old clocks now. a dirty bom is easy to make now. The amount of americium in smoke detectors is extremely minute. It would be far more effective to pull radioactive cobalt from old dental x-ray machines in scrapyards. This isn’t terrorism, it doesn’t even come close. David Hahn didn’t build the reactor to get his Atomic Energy badge – he got the badge, then kept going. It’d be a bit irresponsible of the boyscouts if this were a requirement for the badge. Actually, the nuclear power badge isn’t required at all. However, a certain number of badges is required, and he thought this one would have been interesting. It doesn’t even require actually using radioactive materials, just designing something would do. We looked at a very similar story in our nuclear reactor engineering module for my degree. The bigest problem is that smoke detectors dont actually contain any radioactive material. They use heat sensors and IR beams to detect smoke particles and heat from fires. Also the number of clocks and mantles you would need would, more than likely, work out more expensive than just buying small amounts of radioactive material from a chemical suppliers. Way back when (and today, in some countries) radioactive smoke detectors are/were the norm. They tend to discriminate better, and produce less false alarms due to steam in, for example, kitchen settings. I actually went to the trouble of taking one along from the US back in ’91 to hang in my kitchen, since even the temperature-based fire detector I had in there would occasionally trip, especially when I opened the oven after running it on self-clean. 1) Unfortunately it was not a critical reactor. So technically it was not a reactor at all, but “natural decay in a jar”. 2)If it would have been critical, you would have had the most unstable device ever. Due to the small delayed neutron fraction of Am, and the virtual absence of a Doppler effect. 3) Any reactor capable of reaching criticality, is able to run at an arbitrary power level (cooling and desintegration issues aside). If he would have managed to reach criticality with this configuration, he would have had neutron flash flash and have died. 4) Am is highly toxic, as are all transuranes, playing with them isn’t a nuclear risk as much as a radiotoxical one. So to summarize: this guy did not build a reactor, and the challenge is still open for someone else! Your point 3 is not entirely true. There have been a few criticality accidents where people in close proximity have not died from it. There was one at the Hanford nuclear reservation in 1962. Please wake me when somebody builds a DIY RTG out of one of these piles and a handful of peltiers. Seriously, though… Over here in Colorado (specifically, the old Ft. St. Vrain site), there are pools of spent fuel rods that sit at about 40 C (104 F). One would think that most of the year one could stick some peltiers in the pool and air-cool the other side and generate some useful electricity. You misunderstand – I realise that the Nuclear Energy badge isn’t required. I was saying that it would be irresponsible if building your own reactor was a requirement for getting the Nuclear Energy badge, which is what the post implies. This is what they teach North Korean children in grade school. Remember Kids; Your Neutron Gun is Neutron fun! I’m surprised that nobody mentioned the most excellent use of duct tape. This is food for thought, if nothing else. He could have just bought thorium, americium, and beryllium online. Why bother doing it with latern mantels, smoke detectors, etc? Yonatan Broza liked RC FPV tank rover. sjm4306 has updated the log for FlexNum: A Flex PCB Electromechanical Display. Gerben liked FlexNum: A Flex PCB Electromechanical Display. sjm4306 has updated the project titled FlexNum: A Flex PCB Electromechanical Display. p.spende liked Raspberry Pi Smart Mirror. a.omersayin liked Simple VAWT wind power generator.